: We're getting friendly unit readings, dead ahead. It's the advance pursuit we sent. 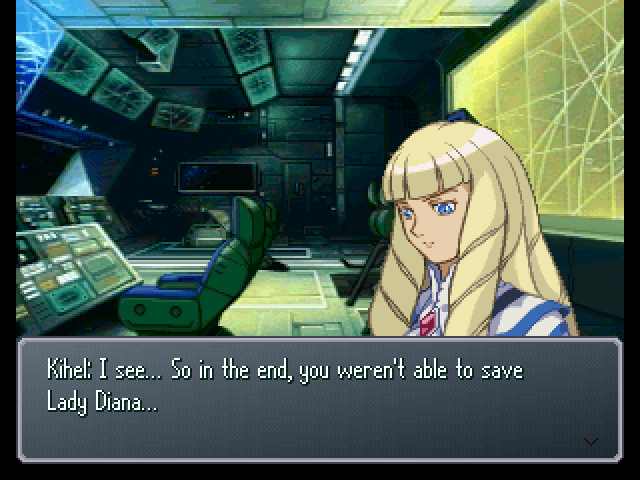 : All right, recover them immediately. : No... It's not your fault. 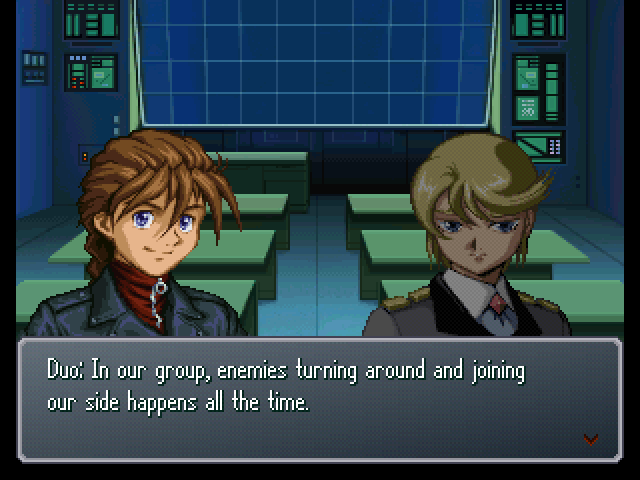 : Even so... What on Earth is that Turn X unit that Heero's group made contact with...? : Lieutenant Harry, do you know anything? : ! You mean the moon has Mountain Cycles, too? : Yes. During the Diana Counter's Operation Homecoming... Ghingnham's army was independently excavating mobile suits. : Lunar Mountain Cycles would have a lot more than Earth ones, right? : The moon back in our time had facilities likeAnaheim Electronics... It's possible that the whole place has been fossilized. : And the Moon Cradle and microwave transmitter still exist. It's entirely possible. 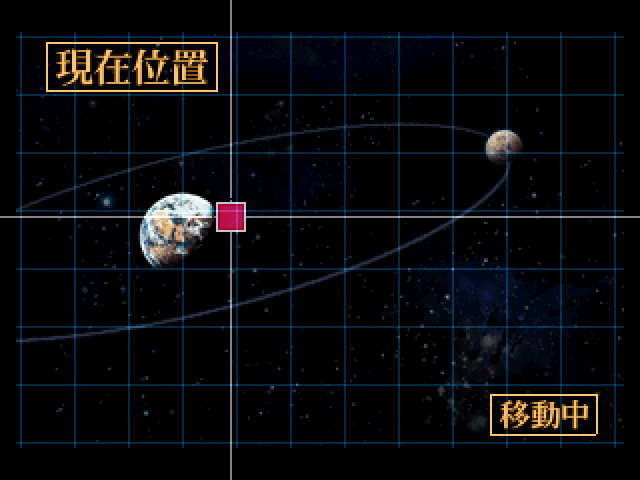 : But still, man, that Turn X... It looked like a mobile suit, but there was something... not quite right, I guess. : It looked like it was acting in a way that would let it gauge our machines' capabilities. 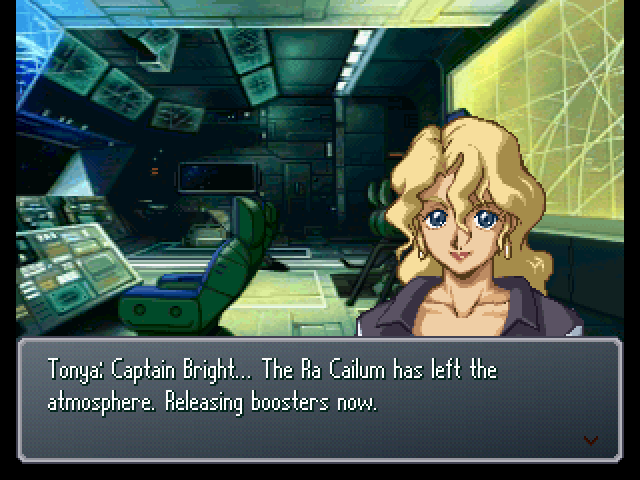 : Do you think it's a Newtype mobile suit? 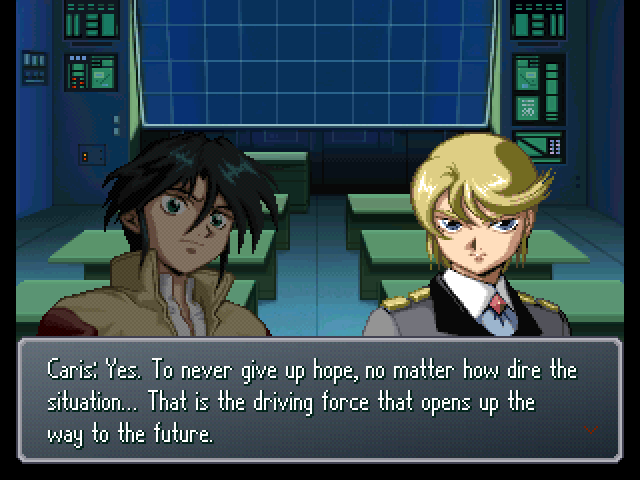 : I don't think so, but from the recent battle data I've gotten, the Turn X... It could have a brainwave feedback system like the YF-21. I would guess that it has something similar to a Psycommu system. : Either way, that guy was dangerous. : That goes double for the guy piloting it, Gym Ghingnham. : Yeah. Something about them is weird... Even given where we are. : You can say that again. And what's the deal with E-minor? I bet they don't mean a guitar chord. : The man called Ghingnham claimed the Turn X, GX, and Turn-A shared some sort of connection. 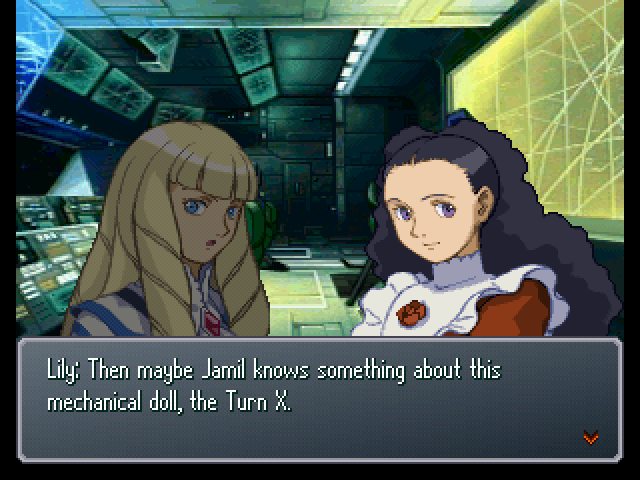 : The Turn-A... You mean the White Doll? : Kihel, anything you might know from your time spent as Lady Diana's double? : Yes. 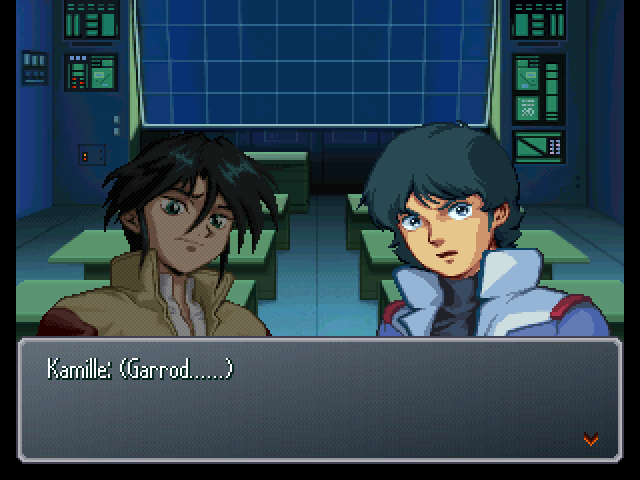 He did once pilot the GX, did he not? That, and... he still seems to be hiding secrets from us. : ...You have a point. It seems the time has come to ask him to spill the beans. : But we're glad to see you looking well. It was looking pretty bad back at Fort Severn. : ...I imposed heavily upon all of you back then. : It's nothing to worry about. As long as you're okay, that's all that matters. : C'mon, now, turn that frown upside-down. No acting gloomy. : Are you kidding? Back in the Balmar War, all three of you guys were enemies! : Hey, I guess we were, now that you mention it. : By the way, Caris... Is your health going to be okay? : Yes, thanks to medical treatment... I was able to pull through without losing my power. 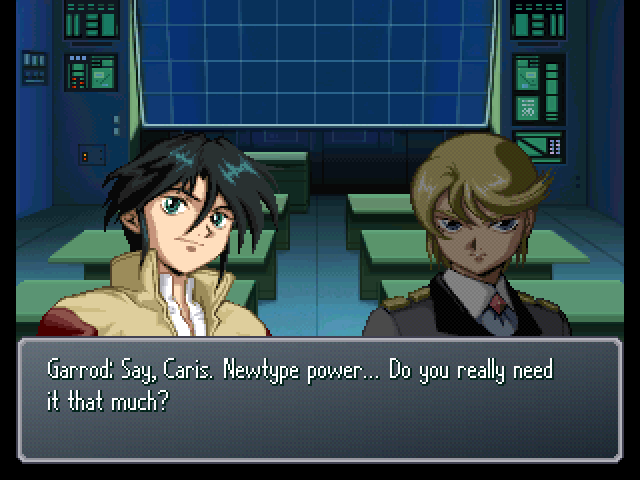 : Newtype power... I never see it do anything but bring misery to people. 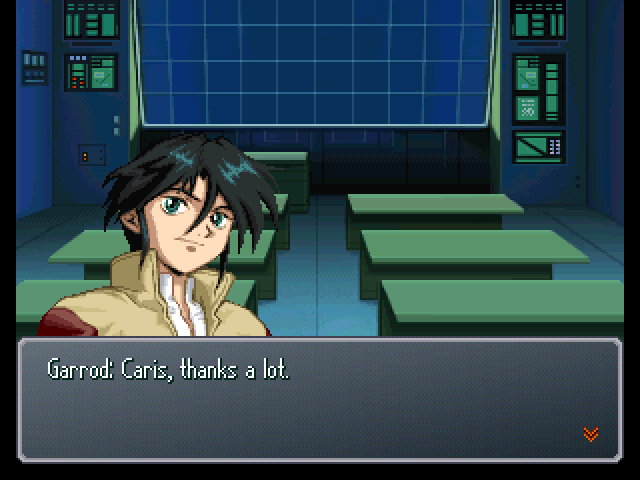 : But, Garrod... I learned something when I met you.